As we all approach the New Year many of us will do what we have done for so many years. We begin to look at setting new goals. Some of us will even try to breath new life into our old goals. Maybe it’s time to put a “DNR” (Do Not Resuscitate) on those old goals. After reading his article I realized before I could jump in I needed to make some quick changes in life. His article caused me to take a bird’s eye view of my life and here’s what I discovered. Just perhaps there is a step we’ve missed. First of all, this article is NOT about setting goals. This is about making room in every area of your life so that you can think clearly and move forward with a new confidence. There’s an expression that says “you can’t see past the clutter” and I believe that’s certainly very true, in my own life. Not sure what this means for you? Let me share my thoughts and my experience with you as best I can. I don’t have all the answers; I’m still a work in progress and am convinced I always will be. My desire is to share my experience with you with the hope that you can relate to some or all of it. Moreover, that it would make even a tiny difference in your life. When our spaces are cluttered our minds become cluttered and creativity either diminishes or may even cease to exist. When it gets to this point we stop looking for the sunshine and we become enveloped by the wind and the rain. “It is common sense to take a method and try it. If it fails, admit it frankly and try another. But above all, try something.” – Franklin Delano Roosevelt. I began this process when I looked in my wallet one day this past week and it just mushroomed from there. I began to look at my frequent shopper point cards. You know the one’s you sign up for believing they will benefit you in some way. Believe it or not I had one in my wallet that actually doesn’t even do that. I have simply kept it because I get 30 days to return a purchase. What was I thinking? I don’t need 30 days to know if it is useful to me, or fits in with my décor, or if it fits. Where are my scissors? This one is hitting the trashcan. Wow, that feels great… I have come to realize I no longer want to be a part of a company’s marketing program at my own expense. Do you keep receipts in your wallet? If so, find a box, any box and place ALL receipts into it. You may be happy to hear my wallet is now able to close. Have you ever joined a mailing list on a whim? More to the point, do you receive emails that you never read? I’m hear to tell you that as of this moment I have hit the unsubscribe button on a number of them. Before you judge me take a really good look at your own list and see what your pattern has been. Do you read yours or do you file them away? This process is a quick fix! I’m pretty certain that it’s not proper etiquette to discuss this in an open forum. However I’ll leave that to the experts. Come on; let’s be honest who isn’t hanging on to underwear that they no longer wear. Perhaps you’ve outgrown it but it is too beautiful to throw out. Or perhaps it has worn out but is so comfy you feel as though you can’t part with it. Make a clean break, take the time to throw out and make room for the new. If it’s been a while since you purchased new underwear you may well be surprised at what is available to you. You know the closet that is supposed to be tidy so that when company arrives it’s a seamless process to hang up guest’s coats. The truth is if yours is like mine it is crammed full of various coats or jackets that may or may not be worn. Why do I do this to myself? Foe me it’s because I like to have choices so that at any given moment I can put a new look together. The problem is that when everything is jam packed there really are no choices to be made. It’s overwhelming! It simply comes down to trying to pull one thing out gingerly so that the whole closet doesn’t come falling down. It’s time to donate some and rearrange the rest, delegating some to who knows where. Perhaps another closet…and the process continues! Actually now that I’m thinking about it, the best way to speedily get things done around the house or in this instance clearing the closet out is to invite people over. Lots of people! This works every single time. Not certain why the garage is known as a place to house our cars. Very few of our neighbors never use it for this purpose. Truth be told neither do we. I believe we should call them mini storage facilities. Let’s face it that’s what they are. They hold all those precious objects that we don’t currently use but perhaps will one day. We moved this year and so there was a great deal of purging and that in itself was/is very cathartic. The trouble is once we were done and the door was closed something phenomenal happened. In the darkness the garage suddenly became an incubator. Strangely in a very short time everything multiplied. What to do, what to do? It just may be time to purge yet again. My husband has a rule where if something new comes into the house something must go out! It’s an awesome way to keep any space free from clutter. I like the sound of it but the sad truth is that sadly have not yielded fully to the process. However, stay tuned. I’ve been asked to consider clearing the desktop on my computer. My husband has tried to convince me for years that the way to a clear mind is to organize this area. I asked him to explain the benefits to me as I for the life of me just didn’t grasp the concept. He explained to me that you can organize them into drawers as such in a filing cabinet. All labeled as to the contents and that they would be easy to access. After many discussions it seems to me that this would be a better system than the one I currently use. What is my system? Actually it’s like a have my fining cabinet on my desktop and the drawers are made of Plexiglas to that I can see what I have constantly and can access anything that is important to me at the touch of a button. However I was able to find the following quote that supports my opinion on the subject. A junk drawer, such a strange concept and yet I have a small one in my kitchen. I guess you could call it a catchall. What exactly does it catch? As I look through mine there is really no rhyme or reason for what I see. It appears at first blush that they are items that could be important to hold on to. However, I think it’s become a safety net for when I can’t find something. This drawer is the first place to look. It’s the go to place and if I’m being honest there’s a sense of security in that. 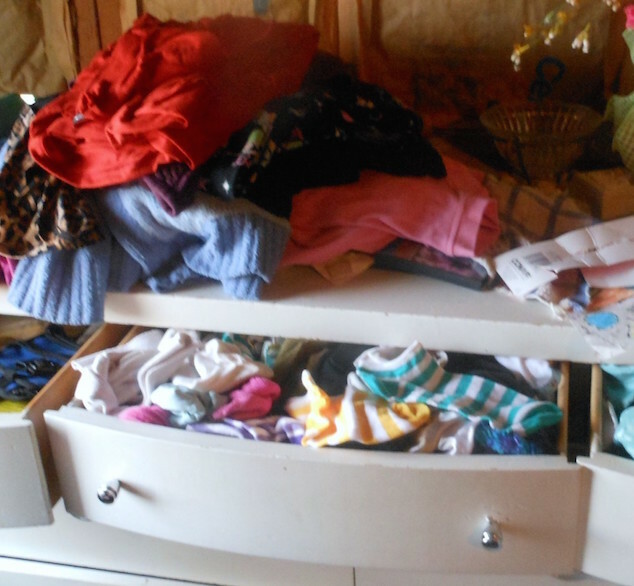 It’s a drawer that is never organized and is ALWAYS jammed full of hidden treasures. So hidden that they are invisible to the human eye. Since this article is about clearing clutter away I will attempt to better organize mine. Who knows perhaps I’ll develop a new concept. Much of it will end up in the trash! Being honest I’m pretty sure that in vapor of time it will magically all reappear in one form or another.